It’s a labor of love, really… this business of asking owners of Galena’s rich cache of historic buildings to open their homes to the public for an entire weekend. We’re asking a lot, we know. Yet every year, roughly a half dozen property owners offer up their homes for touring, giving lovers of history, quality American workmanship and even quirky ingenuity the opportunity to see why Galena’s nineteenth century architecture and interiors are second to none. 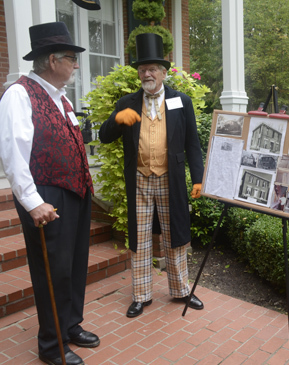 Proceeds from the Annual Tour of Historic Galena Homes benefit the Galena-Jo Daviess County Historical Society. Tickets for the Tour of Historic Galena Homes are on sale now! Tickets purchased on or before September 15 cost $18 per person; $20 per person after that date. Children under 10 are free with an adult. Homes are open on both Saturday and Sunday from 9:00 – 5:00. You can purchase tickets by phone by calling 815-777-9129, in person at the museum or the Gateway to History store on Main Street in Galena, or on the day of the event at any of the homes on the tour. You can also purchase tickets using the link below. Note that tickets purchased online will be available for pick up on a will-call basis. On Saturday will-call tickets will be available at the admission table in the parking lot at Bouthillier Street and Park Avenue behind the train depot. On Sunday, will-call tickets will be available for pick up at the museum at 211 S. Bench Street. Tickets purchased online are on a will-call status. You can pick up your tickets on Saturday at the train depot in Galena at Bouthillier and Park Ave. On Sunday, please pick up your tickets at the Museum at 211 S. Bench Street.